Die-hard try-hard nerds Kelly and Angela are just two librarians looking to explore the vast crazy world of comics, manga, anime, superhero movies and everything else in between. They hang out in libraries by day and transform into mighty podcasters by night! Kept in check by their tireless producer Ali, they fight the terrifying EVIL that comic books aren’t REAL BOOKS! Often trying not to kill each other first. Angela Ocana is an awesome librarian for Santa Clara City, who works with kids, teens, and adults. She was awarded the California Library Associations 2016 Teen Librarian of the Year with Baya, but mostly because she works with the coolest teens around. You can find her at conferences across California talking about librarian things. She is also good at doing stuff, like playing Nintendo and walking her dog. She has been reading comics for a long time and still lovingly puts them in bags and boards. Find her on Twitter at @ninjabookmaster. All spelling mistakes belong to Angela, because spelling is hard, podcasting is easy. Kelly Quinn Chiu is a children’s librarian at Santa Clara City Library. She has degrees in Latin (the et tu, Brute? kind) and hoity-toity English literature from UCLA and Oxford University. Kelly got her start in the world of nerd books as an assistant editor at Tor Books. After getting her MLIS at SJSU, she switched careers but kept the books and the nerdiness. Kelly is a contributor to Tor.com and the B&N Sci-Fi and Fantasy Blog on topics of manga, anime, and other SF&F pursuits. She has two cats and has been carefully stocking her wardrobe with cardigans and practicing her shushing in order to level up as a librarian. Find her on Twitter at @kellyqute. Ali questions everyday why she is helping with this podcast. She thinks it would be easier to let these two go at it, but she fears they would die. Her favorite things in the world are her dog, potatoes, and coffee. 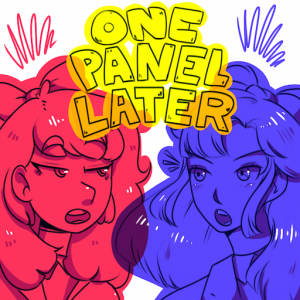 One Panel Later logo created by Arlana McCuin.